This old video of Big Bird singing Everyone Makes Mistakes brought back so many memories for me. Sometimes I find myself singing this song to myself and it really seems to help me, especially when I feel like I haven’t done my best when eating. The next time you are beating yourself up for something you ate or exercise you skipped, remember this song and give yourself a break. Get up, brush yourself off and get back on track! A LONG time ago (back in 2005), I wrote an entry about Margaret Cho’s “F**K It” Diet. She lost weight by having the audacity of throwing away food. I was so inspired by her willingness to let food go to waste at restaurants without bothering to take the food home in a doggie bag. Unfortunately, most of the people who read that post skewered her for being wasteful. From comments calling the idea “pathetically privileged” to others screaming for take home boxes, it enraged almost everyone. For all of you out there who are worried about the waste of food in restaurants let me tell something that may ease your minds (and may gross you out as well). I have worked in restaurants of all sorts, including 5 star and I can guarantee you that Margaret’s leftover prime rib is not going to waste. Whenever a large portion of an entree or app. comes back to the kitchen the bus/wait/dish staff will devour it like a pack of hungry jackals. I’ve seen fights break out over who gets first dibs on leftover steak au poivre. So rest easy people, it’s all good! The next time you’re at a restaurant and you know you will be tempted to eat more than you should if you take the leftovers home, remember echo’s comment. 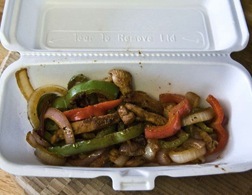 Your food won’t go to waste. It will be gobbled up in the back of the restaurant. I received a reminder from ROFLrazzi today. Back in June 2010, Lindsay Lohan blamed the alarm on her SCRAM bracelet on kombucha, causing it to be pulled from the market. Kombucha typically has no more alcohol than a glass of orange juice, so I was disgusted with her and her poor excuse for falling off the wagon. Why can’t that girl get her act together? Then I cringed in self-knowledge. Who was I to judge Lindsay Lohan? I couldn’t get my eating act together. I had continually fallen off the wagon. 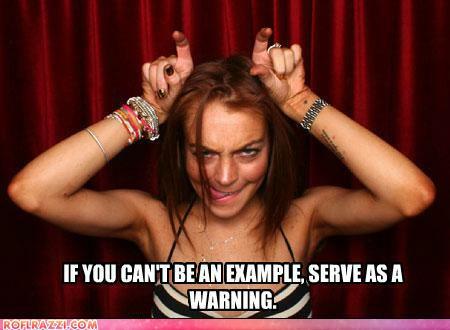 Suddenly, Lindsay Lohan became a beacon of inspiration to me. Every time I considered bingeing on food, I thought of Lindsay Lohan. I didn’t want to be like her. I want to be strong and be able to say no to my addictions, so I step away from the fridge, cupboard or drive-thru. I haven’t been constantly food sober since June, but I have had far more progress than I ever had before I invoked the image of Lindsay every time I was tempted. If I were followed around by paparazzi, taking photos of every time I put a bite of food in my mouth, I would live my life far differently. I imagine them there, watching me and waiting for me to screw up. Poor Lindsay has the real world version of that problem. Just thinking about her helps me make better eating decisions every day. The next time you point a finger at someone who seems to have trouble with an addiction, remember yourself. Pay attention to your own addictions and they will be easier to conquer.